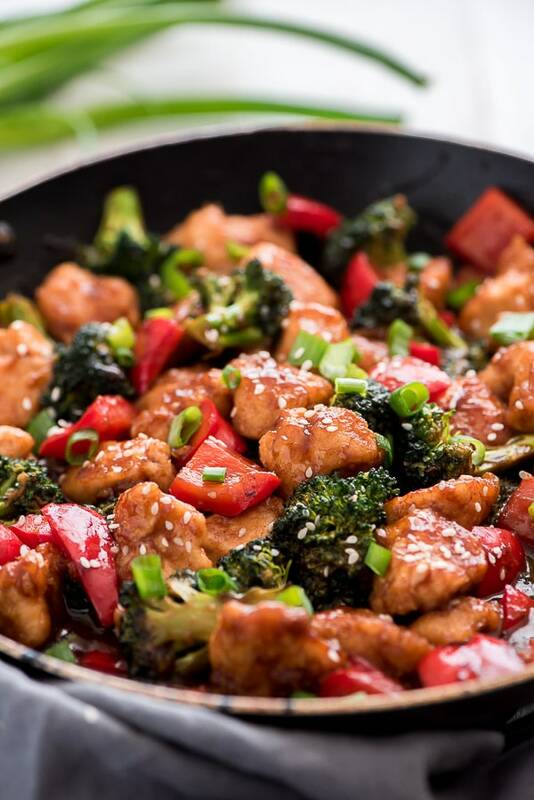 No need to order take-out when you can have this sweet and spicy General Tso’s Chicken on the table in just 20 minutes. Serve it over rice and you have a complete meal the family will love. I LOVE Chinese food! Panda Express was my favorite as a kid and then I discovered PF Chang’s. I don’t think I’ve ever had something there I didn’t like. 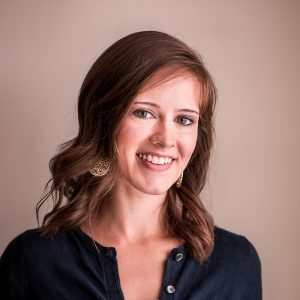 Eating out is delicious and a fun experience but it’s definitely pricey so why not enjoy the same great meal at home for a fraction of the price? 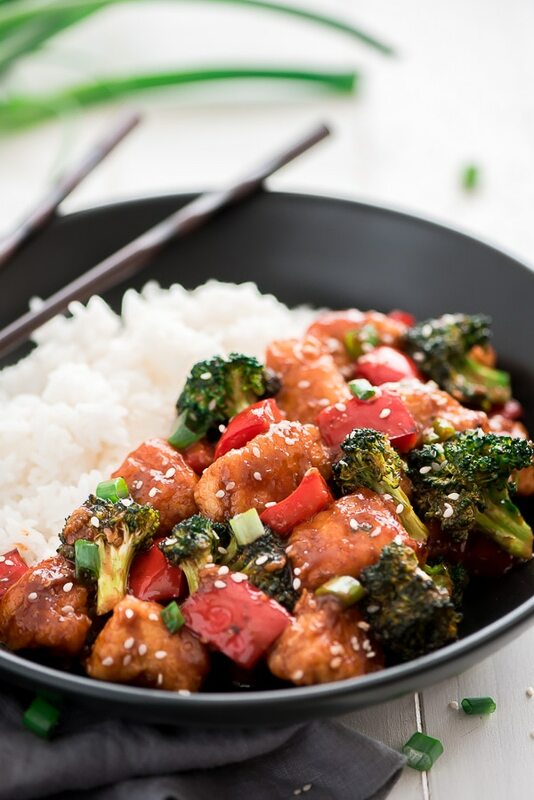 This General Tso’s Chicken tastes just like the restaurant classic and comes together ridiculously quick. There’s no excuse not to make it. 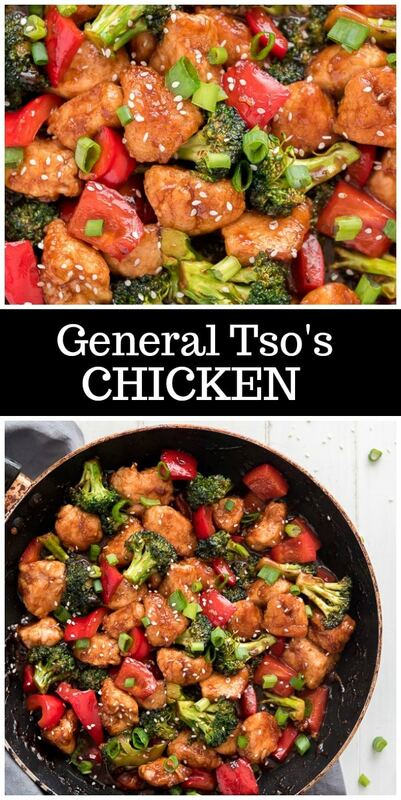 How do you Make General Tso’s Chicken? You’ll first want get your rice started so it’s ready when your chicken is done. Next, toss your chicken with the cornstarch. This is what gives the chicken that classic breaded texture but without actually making a batter and deep frying. You’ll let the cornstarch soak into the chicken while you prep everything else for the dish. Chop up your veggies and then mix all the sauce ingredients together in a liquid measuring cup or mixing bowl. Now you have everything ready to cook. 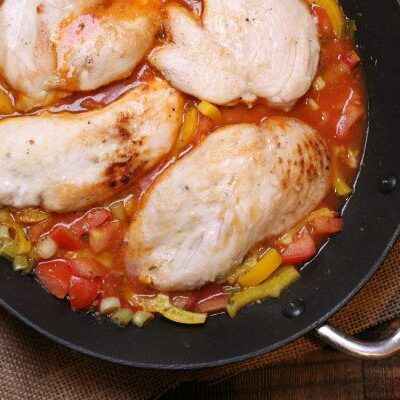 Heat up 1/4 cup oil in a wok or non-stick skillet and then add the chicken. Let the chicken cook for 2 to 3 minutes without stirring. You want it to become golden brown. Flip each piece of chicken and let it cook another 2 to 3 minutes until golden. Remove the chicken from the pan leaving the remaining oil in the pan. 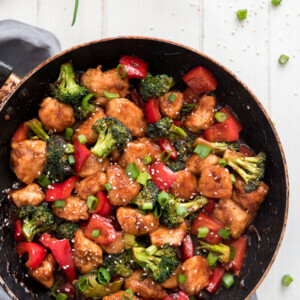 Throw in the veggies and stir fry for 2 minutes and then add the chicken back along with the sauce and stir fry another minute or two until the sauce slightly thickens and coats the chicken. Remove it from the heat and sprinkle with green onions and sesame seeds, and serve it up over a bed of white or brown rice. How easy is that?! 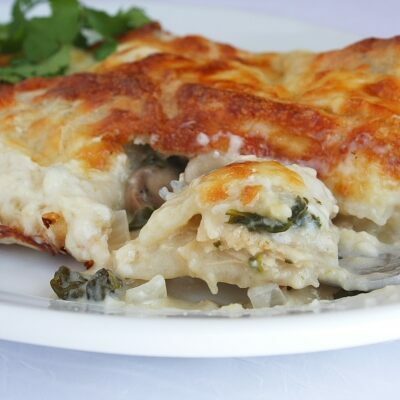 Just 20 minutes for a dairy-free, gluten-free delicious meal that your family is sure to love. I mean, how can your kids not eat broccoli when the florets are soaked in a yummy sweet garlic sauce? Plus this is less expensive and will be on the table faster than delivery. 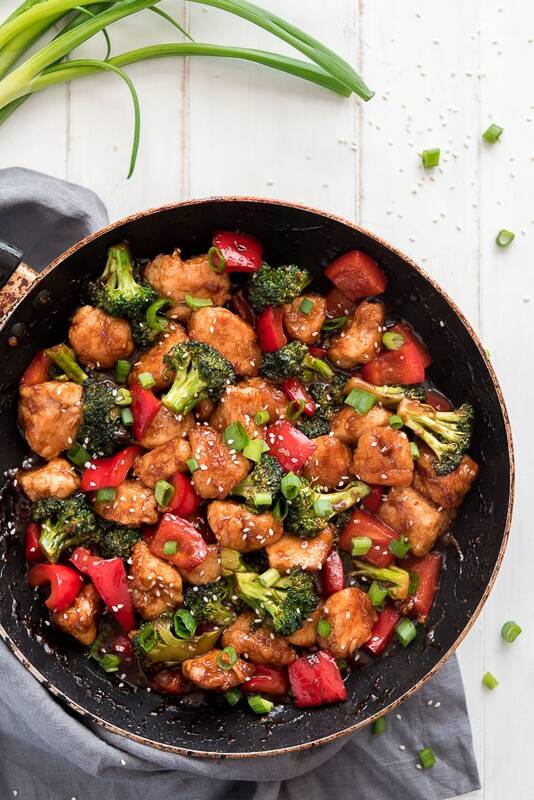 Chicken and vegetables are stir fried in a sweet and spicy, gingery sauce to create a dish that is so much better than takeout. 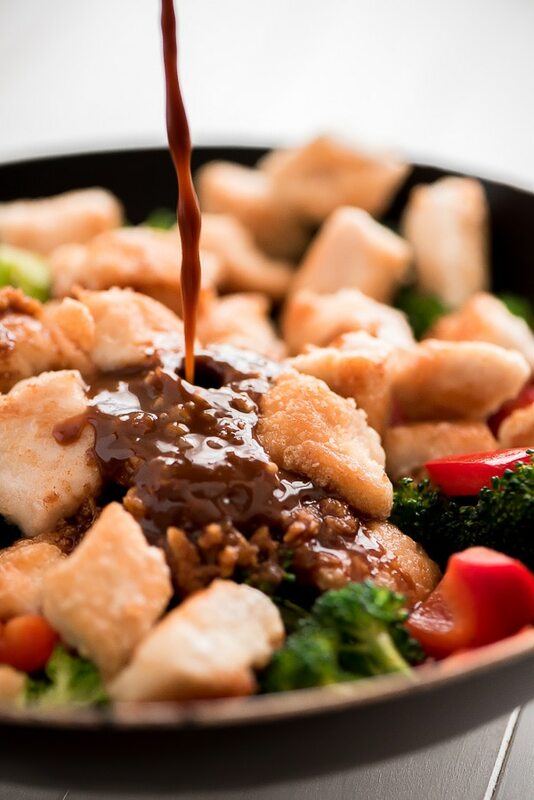 In a medium bowl, mix all sauce ingredients together and set aside. Place chicken in a mixing bowl and toss with the cornstarch until all is coated. Let sit for a few minutes. Heat oil in a non-stick skillet over medium-high heat. Add the coated chicken and let it cook for 2 to 3 minutes, until browned. Flip and cook another 2 to 3 minutes, until browned. Remove chicken onto a plate. 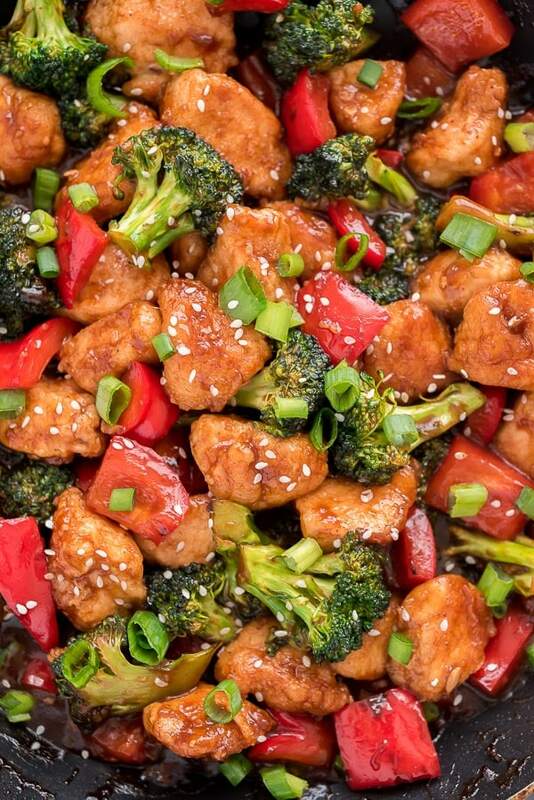 Add the broccoli and bell pepper to the skillet and stir fry for 2 minutes. Add the chicken back into the skillet and pour on the sauce. Toss and cook for 1 to 2 minutes, until sauce thickens. Remove from heat, sprinkle with green onion and sesame seeds, and serve over rice. 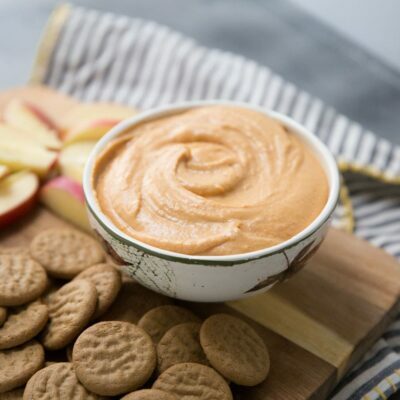 *If you are preparing this recipe as gluten-free or dairy-free , just be sure to use brands of chicken broth, hoisin sauce and soy sauce that are known to be gluten free and/or dairy free. Thanks for sharing, we’re going to try this. It looks so delicious, thanks for sharing. This sounds so good!! I can’t wait to make it tomorrow!